The tremendous resurgence of interest in Latin and Greek in the 1980s across North American colleges and universities has brought with it the urgent need for suitable textbooks in these areas. Instructors who were themselves taught with the old Rivington texts by M. A. North & A. E. Hillard Greek Prose Composition and Latin Prose Composition have responded enthusiastically to the reissue of these and other Rivington titles. This book is indeed of ‘uncertain years,’ but as the ‘Thirtieth Impression, Thirteenth Edition, 1964’ it has well stood the test of time. I am delighted to see it back. 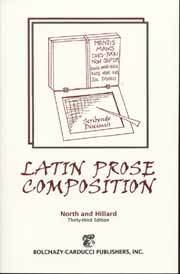 This venerable text helps students practice Latin composition while strengthening their Latin grammar and vocabulary.